You are not logged in. [Log In] Outlaw Homepage » Forums » Announcements » New Product Announcements » Introducing the Model 976! #96259 - 01/24/17 06:29 AM Introducing the Model 976! Fellow Outlaws: We promised you an update after CES on our processors. This report is a bit lengthy. It describes, in detail, what we have been quietly working on. Those who have been following the development of our new surround processors know that there have been many ups and downs along the way. As an analogy, imagine designing a new home and, in the middle of construction, the local building codes are changed. In a similar way, both we, and a number of our colleagues and competitors, have been impacted by some of these changes. After meeting with our chip suppliers and technology licensing companies, we are now pleased with our solutions despite the challenges presented to us all. Based on that, we have news of not one, but two new processors for 2017. As we’ve been reporting, work on a Dolby Atmos/DTS-X processor has been ongoing; however, we encountered unavoidable delays with the availability of software elements for object-based formats. We then decided to take advantage of the significant engineering effort behind this platform and apply it to an all-new, high performance, more affordable processor. It is important to keep in mind that this new product DOES NOT replace our object-based processor. Rather, it allows us to utilize a single architecture so that we are able to offer one model now, followed by the Atmos/DTS-X model later this year based on an already solid design foundation. This allows us to deliver a new, advanced product to those who want the benefits of the latest in HDMI, but who are unable or unwilling to install an 11- channel speaker system. With that in mind, we are proud to announce the latest addition to what will be a growing line of new Outlaw products. Focusing on sound and video quality, ease of use, and expanded connectivity, the Model 976 has what the Outlaw customer expects: a true, no compromise, “best in class” product. •	There are six HDMI inputs, including one on the front panel for quick connection of portable devices. Four of the inputs are HDMI 2.0b, HDCP 2.2, and are capable of 18Gbps bandwidth. This means that all of the latest UHD formats, including HDR-10, Dolby Vision, HLG and the forthcoming Advanced HDR by Technicolor will flawlessly flow through the Model 976 to any 4K/HDR-enabled display. •	An advanced, dual-core DSP to handle the critical work of decoding. •	BOTH BALANCED and CONVENTIONAL outputs, in a 7.2 configuration, fed by high quality DACs. The key LCR channels utilize high-end TI/Burr-Brown DACs, while the four surround channels use the same high quality circuitry that delivers the smooth, open sound of our existing Model 975. •	A robust linear power supply with a custom-designed toroidal transformer. We chose this path and rejected the switch-mode power supply design used in many budget AVRs and processors to protect the analog audio path from electrical noise interference. •	A pure analog 7.1 multi-channel input stage, as well as a selection of pure analog stereo and digital input options. Setup and configuration are both simple and flexible at the same time. For the novice, there is an auto-setup system that measures and enters the settings for speaker distances, channel output levels, and checks for phase issues. For those who wish to create a more custom-tailored sound, there is a manual, ten-band PEQ system. 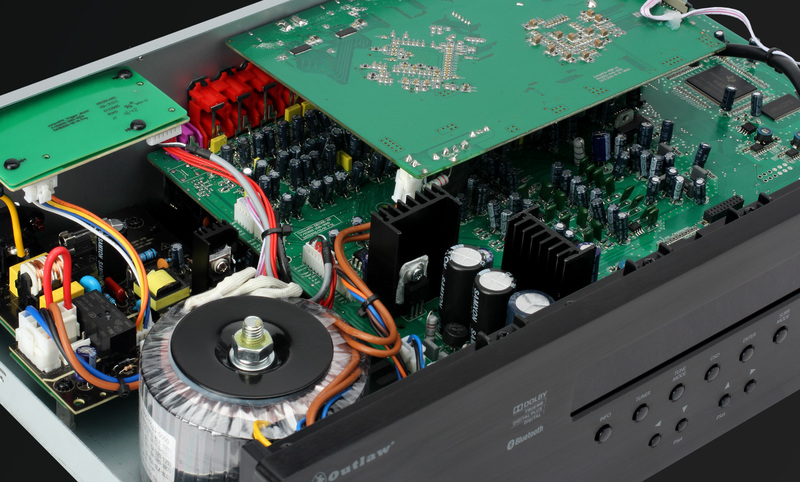 •	These days, “power” is more than an amplifier spec, and the Model 976 has it. There are two trigger jacks, both configurable, to control not only the power amp, but also input-specific devices such as screen relays and automated blinds. Exclusive to the Model 976 in this feature category, are two rear “power-only” USB ports delivering 5VDC, to make it easy to power streaming media sticks, or charge a phone or tablet. •	A Bluetooth module, for high performance, 24-bit resolution, streaming from phones and tablets. •	The Model 976 is wrapped in a brushed aluminum front panel that complements our newest power amplifiers. In addition, a custom-tooled backlit, all-metal remote control is included. •	There are many other details such as HDMI Standby Pass-Thru, a full featured FM Stereo/FM/AM tuner, IR in/out connections, and gold plated RCA jacks. However, the best news about the Model 976 will be its price. At $899 it will set a new standard for audiophile surround sound processors! Even better, for a limited time, Model 975 or Model 990 owners of record may take advantage of a $100 discount and upgrade to a Model 976 for $799. This is NOT a trade-in program, but rather an expression of thanks to our past customers. This loyalty discount will continue to apply to new purchasers of the Model 975. There are still many who need its legacy video inputs, and we will continue to offer the Model 975 for the foreseeable future. We are currently in the final stages of certification. At the same time, an extensive beta test is now coming to a conclusion as our key technology partners and industry veterans wrap up their evaluations. We anticipate very few issues and expect initial production to begin shortly. Stay tuned for updates in February as we hope to have the Model 976 in your systems later this spring. As soon as production starts on the Model 976, our engineering teams will redouble their efforts on our Atmos/DTS-X processor. As mentioned, it is based on the same underlying platform as the Model 976, but utilizes two DSPs and additional DACs for a 7.2.4 channel configuration. It will add additional connectivity options and a few other features that many of you have asked for. Presently targeted to be priced under $1,500, it will be available later this year. We thank you for your support and patience in wading through this long letter; however, to bring you completely up to date on our processor program, there was a lot to write about. As time allows, we will update you along the way on the second processor, and the other products to come from the Outlaws during 2017, including the two new products that were on display by our technology partners at this past CES.